“1-1-2012 and the adventures are starting. May was full of surprises, meeting new people, and bonding with others. I had a magnificent birthday gathering full of lovely friends and close ones. Met a lot of new interesting people through different other get-together. I didn't get the chance to write and keep you entertained, as I was being taken care by a lovely and incredible person. I advice you to try it, as participating with other programs has empowered me in a way. June will be even more challenging, as I will be volunteering in a new country, to work on a market study to help kids with hearing problems and get them knowledgeable about hearing aids. For that month, I will be focusing on kids, and won't probably have the time to work on my cooking and keep you amused with new recipes. I ask you to please encourage me during my new life helping experiment. Have a lovely end of May and June and stay tuned to my stories and adventures. May is my month of Celebrations, one is cause I have been born during this month and this day, twice, plus a lot of special friends of mine did too. May as well, brings in the spring which I love, embraces our nature, greens our trees and the sun light keeps us warm. We feel like becoming alive again after the snow, cold, and coziness. Second cause my Astrological sign is Taurus, which is my favorite, if you know Taurus sign, you might get an idea about my character. A full day of celebrations will start in few hours, wish you can join me! Thank you for being part of my life, for taking the time to read my blog, create the recipes, and just gaze into my writings, hoping to, at least one day, to meet you..
How about trying a new Lasagna recipe? I made it, and I loved it..Now, it is your turn. Mix gently in large bowl with salt. Let drain for 20 minutes, stirring for 5 minutes. PS: I used 1/3 of the ingredients. An add-on to the Lasagna. Preparing Tomato Sauce, fast and easy, and can be used in different recipes. Mmmmm. Soak the dried tomatoes beforehand, keep the soaking water for other recipes. Crush the fresh tomatoes with rehydrate tomatoes in the Vitamix, carrots, onios, garlic and olive oil. Add minced pepper, celery, and onions, and mix with the puree and spices ... let stand 15 minutes. Cheese... yes, we do eat cheese.. we create our own made by Nuts. How about trying Macadam Ricotta Cheese. Reduce the macadam nuts into either powder or small piece using a food processor or a Vitamix. Then incorporate the water and sea salt. Add later the green and lemon and mix well. Chocolates, chocolates, chocolates... Did you know that it is an Aphrodisiac, especially when it is totally RAW! Plan a nice evening with your lover.. and create a Noir Désir, savour it, indulge in its essence, sweetness and Love. Starting with the Crust, make sure you have those ingredients. Put all ingredients, except the cocoa nibs, in a food processor. Grind a few moments to get a crisp crust, but uniform. It is important not to over grind in order not to reduce the brazil nuts in butter. Add the cocoa nibs in a food processor and blend for a few seconds to incorporate them. Can be conserved for 2 weeks in the refrigerator in an airtight container. Prepare the milk with the coconut flakes and water. (similar to-any kind of nut milk preparation, check the sesame milk recipe). We will be using 125ml (1/2 cup) of milk in this recipe. Place the milk in a food processor with the remaining ingredients, except for the cocoa nibs and the melted coconut oil. Reduce in a uniform and smooth dough. Add the melted coconut oil and continue mixing to incorporate. Finally add the cocoa nibs in a food processor and mix for a few seconds to incorporate. Spread the mousse on the crust. Clean the edges of the mold in order not to stain the ganache. Add cocoa powder and mix well to incorporate. Spread the ganache into the mold. Place in refrigerator about 5 hours to harden. Decoration with Strawberries, the love fruit. Can be conserved for 10 days in the refrigerator in an airtight container or freezer for 4 months. Waking up a bit late on this beautiful Sunday morning, after spending last night under the most glamorous full Moon of the year. Decided to start a fresh day before heading out to have a day in the nature. 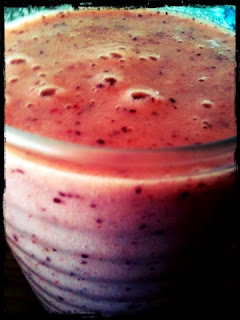 What is better then mixing three types of fruits and savor it. Mix them in a Vitamix and drink! Green in a smoothie, doesn't sound tasty for some, but totally nutritional for all. Mixing it with lots of fruits, wouldn't give the full flavor of the green, whereas it is filling your body with good amount of Chlorophyll, adding new blood to your veins. I tried mixing it this morning, and it tasted fruity! Looked into my fridge and found some fruits and a kale. Finally the time has come to prepare the first recipe I wrote on March 1, 2012 in the Raw Dessert section; "Choco-Extacy." The past weekend, I had to prepare one tarte, and two cakes... Yummy! That was a full energetic weekend.. Was getting ready for my big presentation and tasting project. How exciting!! The past month was really out of the usual, and I love it! Please prepare the following.... and start creating! Put all dry ingredients in a food processor. Add the date paste then mix until obtaining a paste. Place in the bottom of a cake pan and spread the paste equally. Soak the dates for 20 minutes, then place them in a food processor until having a creamy texture. Mix all ingredients by hand or in the food processor. In a food processor, make a cream with the cashew nuts, lemon, agave syrup, Vanilla, sea salt and the 2 cups of water. Place the Agar-agar in the 1 cup of water* and bring to boil within 1 minute while stirring frequently. Add the boiled Agar-agar in the cream, pour it quickly on the cake and put it in the fridge for 20 minutes. Decorate after removing it from the fridge. Recipe from: Full day class @ Crudessence. 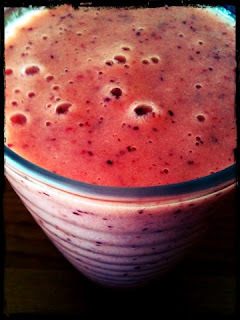 Kick Start your morning with some Jazzy smoothie full of energy! Add all the ingredients in the vitamix, and mix until smooth. If you want it cold, use ice with the water.